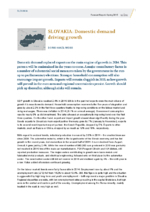 Domestic demand replaced exports as the main engine of growth in 2014. This pattern will be maintained in the years to come. A major contributory factor is a number of substantial social measures taken by the government in the run- up to parliamentary elections. Stronger household consumption will also encourage import growth. Exports will remain sluggish in 2015, as low growth will prevail in the euro area and regional uncertainties persist. Growth should pick up thereafter, although risks will remain.